Thanks to GentleKindness for nominating me for this award. I was tickled pink. I started this blog to become more real (share aspects of myself and my mental challenges that I usually keep hidden) and to help others with similar struggles. I have found immeasurable help and a sense of community interacting with my fellow bloggers and it has become a bright spot in my life. I’m not computer savvy, so you’ll need to type these out to reach these great blogs. I am my harshest critic. I have compassion for other people but have to work at having compassion for myself. One thing I do that seems to help is to imagine that I am a character in a book. I view my life page by page and begin to see someone that deserves empathy and shouldn’t be judged too harshly. Perhaps you too are hard on yourself. Try this exercise and imagine you are a fictional character. We all could use a little less judgement and a little more self-compassion. This is my favorite quote from one of my favorite books. It is the only quote that I have memorized and I will sprinkle it within a conversation any chance I get. Especially to children as they will be more likely to ask what I mean by the quote. They are intrigued by anything invisible. But what does essential mean? Then I tell them that what is important is invisible to the eye. Usually this leads to a minute of quiet reflection on their part as they ponder the little prince’s words. I also quote it to myself when I feel the stirrings of consumerism leaching into my heart. We need children to teach us or reteach us important things we have forgotten. If you have somehow missed reading this wise and wonderful book, do yourself a favor and get yourself a copy today and read it. Patience I have, but hope remains elusive. This quote and post from The Seeds 4 life reminds me that it is important that I keep the lamp of hope lit within me. Hope Is Patience with the Lamp Lit – Tertullian. Sometimes the worst feeling that comes with having a mental illness is shame. After my husband died, I was no longer able to hide my illnesses. I was unable to work full time because of my PTSD, anxiety, depression and agoraphobia. Then, I disappointed myself and a lot of people when I ended up in the psych ward several months ago after overdosing on valium. I’ve been trying to write a post about this for some time now and was unable to because I was feeling so deeply ashamed. But not today. I’m not sure why. Perhaps it is due to my latest therapy session with my new therapist Annie. (I moved and had to change therapists after seventeen years). I was a mess during it. Anxious and wringing my hands, I had feelings in front of her that I normally only have alone. Closing my eyes and rubbing my left eyebrow incessantly, I spoke of infinite anxieties, my feelings of deep shame, haunting dreams and the past that won’t let me go. But, I didn’t feel shamed or judged by her, just understood and accepted. This has allowed me to forgive myself a bit. 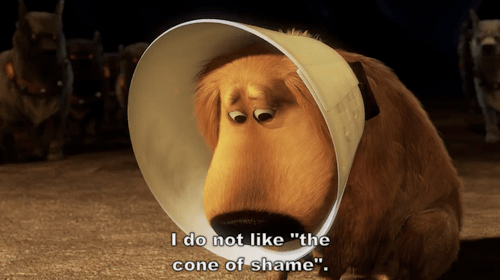 I still see the cone of shame, but it sits over in a corner. I am no longer wearing it. I dance when no one watches, she dances for others to see and is wonderful. If You Need A Smile, Watch This….. 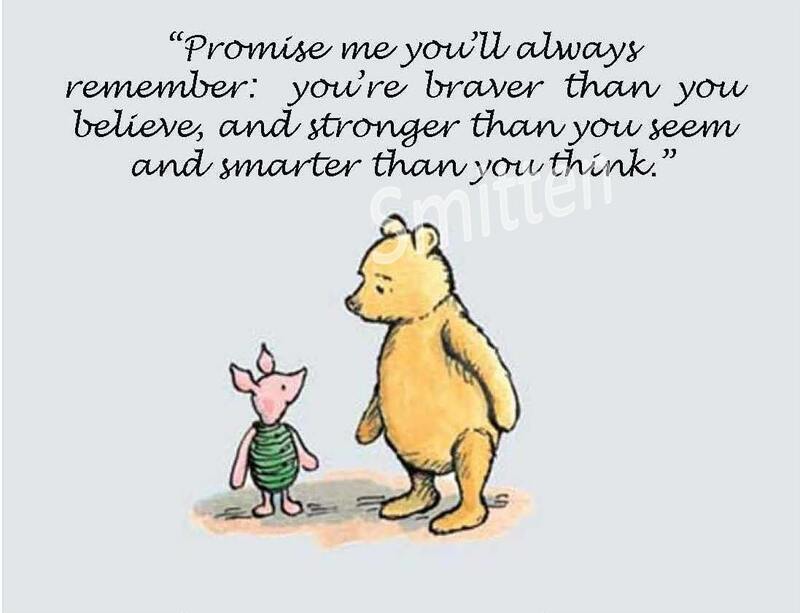 I think on most days I need to read this message from Pooh Bear. Having PTSD and agoraphobia among other things makes me feel cowardly, weak and stupid. Stupid, because I can’t think my way out of my fears. I know that they are by and large illogical. Part of me thinks if I was smarter I’d be able to reason my way out of the fearful mess that is my psyche. Weak, because I cannot push past the ridiculous fears that cripple my life much of the time. Cowardly, because instead of standing up to them, I allow them to rule over me. But, I do stand up to my fears sometimes and do something that causes me anxiety anyway. I am not always cowardly. I am not always weak. And, the more I share with and learn from fellow bloggers and my therapist, I realize that my symptoms have nothing to do with my intelligence. So, I will take to heart this wisdom from the bear who claimed to have “very little brain”. He is so much smarter than he thought.